It’s been four years since Human Nature threw the dice and embarked on their American dream. 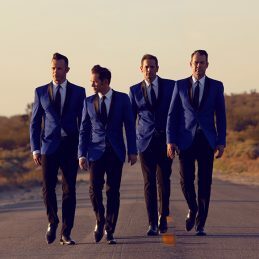 The four-piece eschewed the traditional coast-to-coast trek of pubs and clubs, instead grabbing a foothold on the colourful Strip of Las Vegas. The group not only survived Sin City; they’ve thrived. On the 25th March 2014 Human Nature will perform their 1000th show on the Las Vegas Strip…. Human Nature’s career is built on a bedrock of friendship. Few bands can boast the same line-up after more than two decades in the business. We were all friends before we became the group. There was no audition process. There was no thought of it being a business. When a decision is made, it’s done four ways.” explains Phil . Since signing with Sony Music Australia in 1995, Human Nature have released nine albums – five of which went to No. 1 in Australia. They’ve achieved 23 platinum awards, 17 top 40 hits and five top 10 hits worldwide. In 2005, Human Nature released the five-time platinum album “Reach Out – The Motown Record,” a collection of Motown hits. It went on to become the highest-selling Australian album of 2006, according to ARIA, and it reached No. 1 on the US Billboard Heat Seekers chart. The relationship with Motown runs deeper still. Outside of Australia, New Zealand & South East Asia, Human Nature has signed with Universal Music Enterprises, a deal which brings them into Universal Music Group’s Motown family. Human Nature remain signed to Sony Music Entertainment Australia, the music company that discovered them and launched their career all those years ago. On November 8th, 2013, Human Nature’s first festive album “The Christmas Album” was released fast securing platinum status and holding in the coveted 2013 Christmas Albums Top 5 & was the 3rd most successful Australian ARIA album of 2013. The group also returned to for sold out Australian shows as part of their 11th national tour.